The Global Volcanism Program has no activity reports for Moekeshiwan [Lvinaya Past]. The Global Volcanism Program has no Weekly Reports available for Moekeshiwan [Lvinaya Past]. The Global Volcanism Program has no Bulletin Reports available for Moekeshiwan [Lvinaya Past]. The rim of the dramatic 7 x 9 km Moekeshiwan [Lvinaya Past] caldera on southern Iturup Island drops to 50 m below sea level on the NW side. Lvinaya Past, meaning Lion's Jaw, derives from a rock resembling a sleeping lion that breaches the surface at the center of the submerged caldera rim. A shallow 5-km-wide passageway on the NW side allows the Sea of Okhotsk into the caldera basin, whose floor is 550 m below sea level and lies almost 1 km below the caldera rim. The caldera formed about 9400 years ago during one of the largest Holocene eruptions in the Kuril Islands. Thick dacitic pumice deposits from this eruption form the 50-60 m high Yuzhny (Southern) isthmus, which joins the three southernmost volcanoes on Iturup Island, Rokko, Moekeshiwan, and Berutarubesan. Erlich E N, Melekestsev I V, 1972. Evolution of Quaternary volcanism and tectonics in the western part of the Pacific Ring. Pacific Geol, 4: 1-22. There is no Deformation History data available for Moekeshiwan [Lvinaya Past]. There is no Emissions History data available for Moekeshiwan [Lvinaya Past]. 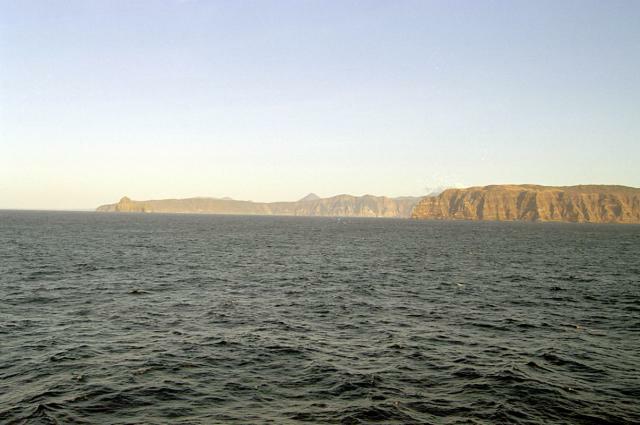 The widely breached Lvinaya Past caldera is seen here from the west, with its NW rim at the right and the eastern rim on the left horizon. The dramatic 7 x 9 km Lvinaya Past (Lion's Jaw) caldera on southern Iturup Island formed about 9400 years ago during one of the largest Holocene eruptions of the Kuril Islands. The volcano derives its name from a rock resembling a sleeping lion (the small peak at the far left in front of the tip of the NE rim) that breaches the surface at the center of the 5-km-long submerged portion of the caldera rim. Photo by Alexander Rybin, 2001 (Institute of Marine Geology and Geophysics, Yuzhno-Sakhalin). Large Eruptions of Moekeshiwan [Lvinaya Past] Information about large Quaternary eruptions (VEI >= 4) is cataloged in the Large Magnitude Explosive Volcanic Eruptions (LaMEVE) database of the Volcano Global Risk Identification and Analysis Project (VOGRIPA).